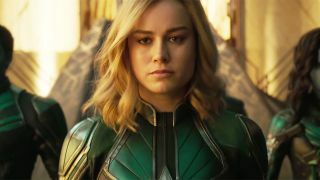 The cat’s out the bag: Captain Marvel has reportedly already been shown to a handful of lucky people. As you can imagine, half of the universe is waiting for the first reaction of the movie with bated breath. Is it any good? What are the highlights? Any low points we should know about? While details are a little thin on the ground, it appears that Carol Danvers’ feline friend has stolen the show. Yep. Not Brie Larson making her MCU debut, not young Nick Fury, and not even the return of Agent Coulson has stirred as much reaction as Goose the frickin’ cat. According to a tweet from journalist Steven Weintraub, the Captain Marvel screening ended with “everyone talking about the cat.” Because of course. We first spotted Goose the cat – Chewie, as he’s known in the comics before being renamed in the MCU – nuzzling up to Nick Fury in the second Captain Marvel trailer. Since then, everyone’s fallen in love with the purr-fect pet. He’s even got his own poster. Yet, the reason why people can’t get enough of the little guy in the final cut of the movie is probably due to the fact he’s hiding a slimy secret. Goose (probably) has tentacles. In fact, if we follow the comic book stories, Goose is a Flerken, an intergalactic species, in disguise. He gets a little angry when he’s threatened, let’s put in that way. It might even be how Nick Fury loses his eye. We’ll have to hold out until March to see if Goose really does have an impact on audiences everywhere but, for now, it’s nice to see some positive buzz around, even if it is just about a cat. Ok, not all of the upcoming movies coming your way in 2019 has Goose the cat but I'm *sure* they'll still be worth watching. Promise.